When Amazon asked cities to bid to host its second North American headquarters, Wharton students answered with two competitions to persuade the tech retail giant to choose Philadelphia. The winners and finalists presented to judges and Philly Mayor Jim Kenney on October 13, 2017. Amazon set off a frenzy in municipalities across North America when it announced plans to build a second headquarters, codenamed HQ2. The company estimates that they plan to invest over $5 billion in construction and to grow this second headquarters to include as many as 50,000 high-paying jobs. So how are they going to decide where this second headquarters is going to be? They’re looking to cities and regional economic development organizations to submit proposals explaining why Amazon should set up HQ2 there. By providing detailed figures and statistics about their current headquarters in Seattle and the specific criteria that they are looking for, Amazon is making this a public process. Students and faculty at Wharton decided to support the city’s candidacy through both a writing competition and a case competition. Philadelphia is a strong contender, picked by Moody’s as one of the top three cities for HQ2. While the writing competition was led by faculty, the case competition was a student initiative that grew out of the excitement around the Amazon opportunity. 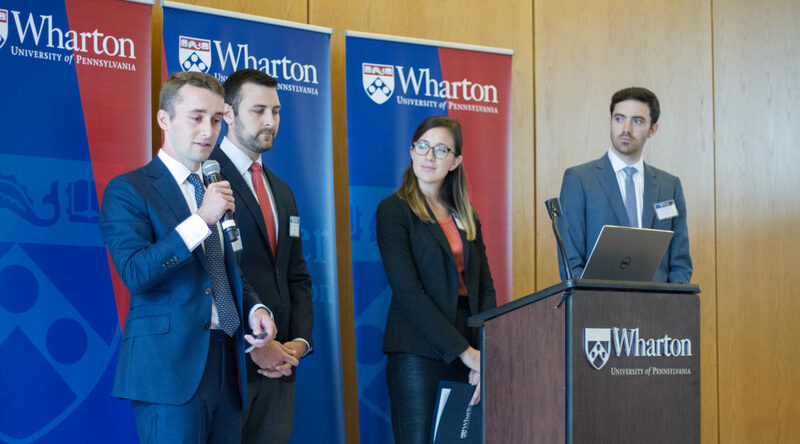 Two undergraduate clubs at Wharton, The Sig.nal and the Marketing Undergraduate Student Establishment (MUSE), collaborated to organize the Amazon HQ2 to Philly Case Competition, which was open to both MBA students and undergrads. Teams of two to four submitted both a presentation summary on one of four subtopics: financial and tax incentives, talent base and employee incentives, strategic tech-focused incentives, current and new legal incentives. The four finalist teams highlighted the key advantages of choosing Philadelphia to be the home of Amazon’s HQ2. Team Wharton Prime, for example, laid out a set of hefty financial incentives ($12.5 billion to $15 billion in tax breaks and free land) and suggested that the city’s government instate an “Amazon Happiness Officer” who would serve as the company’s primary point of contact to cut red tape. With respect to technological infrastructure, Team Delphi recommended that Amazon partner with Comcast to use their machineQ platform. The team added that this platform, based on the LoRa technology standard, will give Amazon customer data to analyze that they previously did not have access to. Finally, presenting on legal incentives, Team Philly Cheesesteaks reiterated the fact that “Philadelphia has a unique ability to retain talent through its cost of living,” before going on to propose a totally new idea. To reduce the legal barriers that skilled talent outside of the U.S. face, the team proposed starting “an immigration entrepreneur visa program” similar to Massachusetts’s Global Entrepreneur-in-Residence program. The judges, comprised of Wharton professors Gad Allon, Saikat Chaudhuri, Susan Wachter, Robert Inman, and Sara Jane McCaffrey, chose Team Wharton Prime and Team Delphi as co-winners. Amazon Case Competition winners Team Delphi (all M&T students, W’19, E’19) with Philadelphia Mayor Jim Kenney. 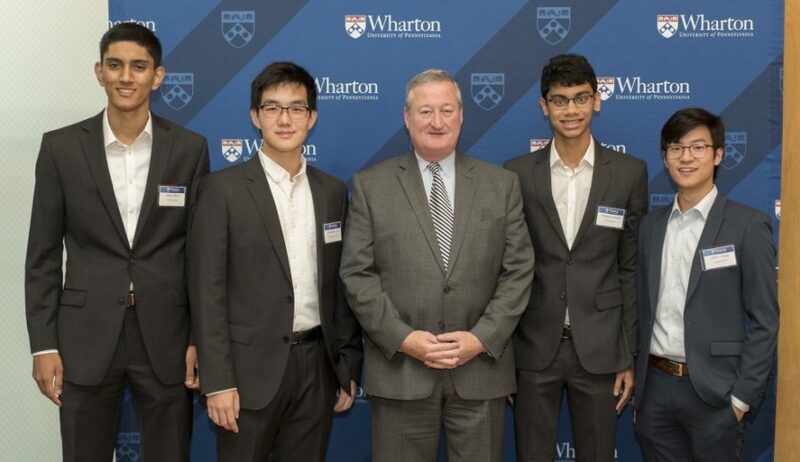 Left to right, Ameya Shiva, Johnathan Chen, Mayor Kenney, Tanmay Chordia, and Jeffrey Cheng. The Wharton Communications Program launched the Amazon Writing Competition to give undergrads and MBAs the opportunity to advocate for the City of Philadelphia. Entries took the form of a 500- to 750-word proposal. The Program’s panel of judges featured journalists from a range of leading publications, from the Financial Times and the Associated Press to the New York Times and the BBC, three of whom are Pulitzer-Prize winners.